A hothouse little novel exploring the slowly corrosive and claustrophobic nature of sudden wealth of power on the modern family. The expert pacing in this slim but ultimately cautionary tale still knock out out—read in one sitting! A young man's close-knit family is nearly destitute when his uncle founds a successful spice company, changing their fortunes overnight. As they move from a cramped, ant-infested shack to a larger house on the other side of Bangalore, and try to adjust to a new way of life, the family dynamic begins to shift. Allegiances realign; marriages are arranged and begin to falter; and conflict brews ominously in the background. Things become “ghachar ghochar”—a nonsense phrase uttered by one meaning something tangled beyond repair, a knot that can't be untied. Vivek Shanbhag is the author of eight works of fiction and two plays, all of which have been published to wide acclaim in the South Indian language Kannada. He was a Fall 2016 resident at the International Writing Program at the University of Iowa. The first of his books to appear in English, Ghachar Ghochar was excerpted in Granta’s 2015 India issue. Srinath Perur (translator) is a writer and translator whose work has appeared in n+1, Granta, and the Guardian. He is the author of If It's Monday It Must Be Madurai, published by Penguin India. 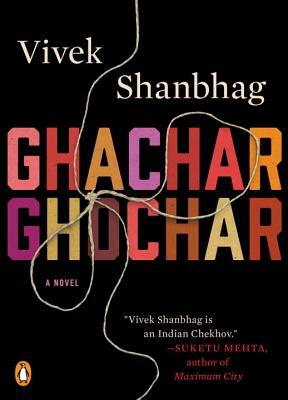 "[Shanbhag] is a master of inference and omission...What’s most impressive about Ghachar Ghochar...is how much intricacy and turmoil gets distilled into its few pages...[A] wise and skillful book." "A classic tale of wealth and moral ruin and a parable about capitalism and Indian society." "Ghachar Ghochar introduces us to a master." "A feat of taut, economical storytelling...[with] moments of wonderfully dark, often unexpected, cynicism." "One of the best novels to have come out of India in recent decades." "In this exquisitely observed, wry and moving novel, the smallest detail can conjure entire worlds of feeling. Vivek Shanbhag is a writer of rare and wonderful gifts." "One of my favorite contemporary writers in English translates one of the leading figures of Kannada literature. The result is mesmerizing, distressing—and altogether brilliant." "[Shanbhag is] an extraordinary storyteller — one astutely alive to the competing forces of self-interest and empathy." "A firecracker of a novel...concise and mesmerizing." "A Tolstoyan portrait of family conflict and shifting priorities in modern-day India....Captivating." "A compact novel that crackles with tension."